To provide airlines with greater control over their offers, Farelogix has added FLX Shop & Price, FLX Schedule Builder, and FLX Availability Calculator to its flagship Airline Commerce Gateway. With the addition of these three NDC-aligned engines, airlines can use the enhanced platform to provide dynamic merchandising, pricing, availability, and schedule building as part of real-time offer creation and delivery across all channels. FLX Shop & Price, FLX Schedule Builder, and FLX Availability Calculator are currently in test with three airlines. The new engines are rules-driven, fully under the airline’s control and, in an industry first, eliminate costly look-to-book or search volume limitations. Designed for unlimited scalability and millisecond response times, the new Farelogix pricing, availability, and scheduling engines deliver superior functionality and performance at a significantly lower cost of ownership than legacy solutions from airline PSS/GDS providers. They are fully interoperable with the FLX Merchandise platform, and feature a common graphical user interface (Offer Designer) that allows intuitive and highly flexible rules definition for all engines. The new components are also integrated with the Farelogix Open Connect (formerly Direct Connect) technology, which provides PSS-agnostic connectivity to airline systems and orchestration of shopping, booking, ticketing, ARC/BSP reporting, and order management workflows. A certified NDC XML API serves as the airline’s single delivery vehicle for all sales channels and touchpoints. FLX Shop & Price (new): Provides an airline with a purpose-built shopping, offer, and pricing engine to handle NDC-aligned shopping, offer-creation, faring, and pricing requirements within the Gateway, including published fares from ATPCO, private fares, fare families, dynamic pricing, affinity and attribute shopping, and merchandising and ancillary offers generated directly by the airline. Built to process pricing data from multiple sources – traditional fare filing, airline direct-to-engine data, bid/sale data, or any combination – FLX Shop & Price provides the airline with complete long-term pricing flexibility. FLX Availability Calculator (new): A high-performance, high-scalability solution that enables an airline to calculate its own availability on demand, without taxing the PSS and while retaining full airline IP over its proprietary rules algorithm. Designed for high transaction volumes, NDC shopping, large date-range processing, and affinity and attribute shopping, FLX Availability Calculator provides dramatic PSS cost savings and new revenue by optimizing search results including dynamic, personalized availability searching with unlimited query capabilities. FLX Schedule Builder (new): Puts the airline in full control of dynamic, personalized schedule building, and also opens the door to new revenue opportunities by optimizing schedules based on the most profitable connections and routes. FLX Schedule Builder provides support for large date-range processing and point-of-interest and merchandising-driven schedules, with unlimited scalability and unparalleled response time – all without taxing the PSS or any third party (e.g., GDS). FLX Merchandise: An airline-controlled merchandising and rules engine that allows the airline to create custom-tailored product and service offers for dynamic retail across multiple sales channels, including airline.com, mobile, check-in kiosks, call centers, and travel agencies (direct or via GDS) – all without hard coding and in a manner that is PSS-, channel-, and IBE-agnostic. Offer creativity and personalization, speed to market, and extended development tool capabilities are signature components of this industry-leading engine. FLX Open Connect (formerly Direct Connect): Allows the user to make and manage bookings and reservations out of the Airline Reservation system using whatever type of messaging protocol is required (e.g., EDIFACT, OTA, XML, GDS, or proprietary messaging) and with full support for NDC Offer and Order Management. All content is standardized and normalized in XML. 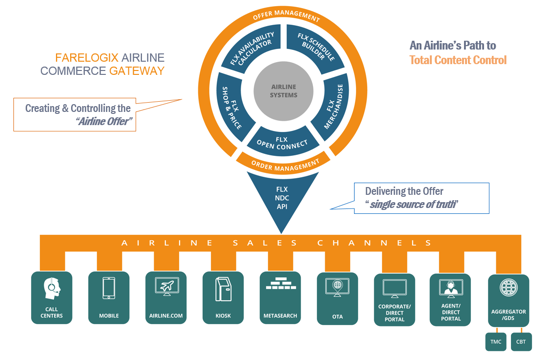 FLX Open Connect manages all required orchestration, including integration with the airline PSS and other systems, channel management, ticketing, settlement and reconciliation (including ARC/BSP), travel agency integration, and a comprehensive Developer Support program. FLX NDC API (NDC Level 3 Certified): Provides a single, robust delivery API by which the airline’s full suite of content reaches the marketplace, including the airline’s kiosks, call center, website, and mobile channel. The airline’s NDC API can also be implemented directly with agencies, OTAs, and corporate booking tools, or through a GDS or other content aggregators. Farelogix also offers the SPRK Point of Sale tool, a web-based travel agency point-of-sale system that is fully integrated with the FLX Airline Commerce Gateway. In use by thousands of agencies worldwide, SPRK showcases the airline's product using Brand Standards and Customer-Specific Offers in an intuitive and efficient agent-selling environment. SPRK provides comprehensive support for shopping and sales (including custom fare bundles, fare families, and à la carte merchandising), document issuance (ticket and EMD), and servicing (exchange, refund, etc.) of air travel content. Are You Shopping for a Shopping Engine?